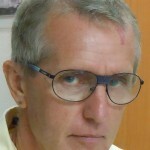 Independent writer, journalist, photographer and former managing editor of the TODAY Newspaper on St. Maarten. 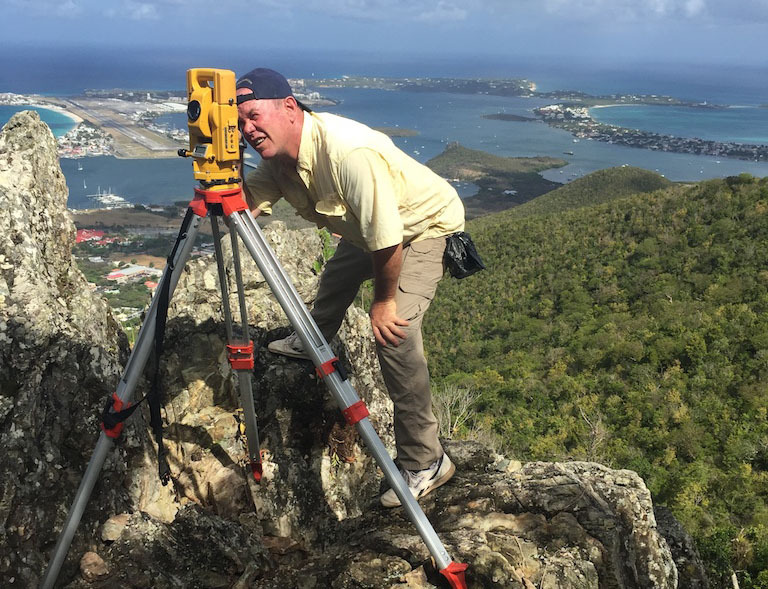 PHILIPSBURG – Hurricane Irma put the Rainforest Adventure Park to the test in September of last year but the project withstood the monster storm perfectly even though the wind speeds at the top of Sentry Hill must have been out of this world. Photo caption: Chief engineer John Dalton at work. Photo skytraclifts.com. 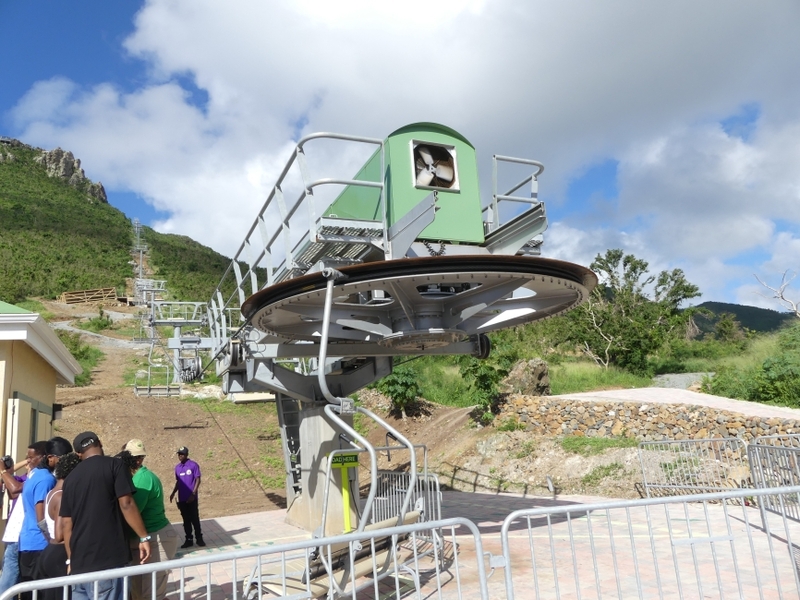 Top photo of Rainforest Adventures Skylift installation by Hilbert Haar. 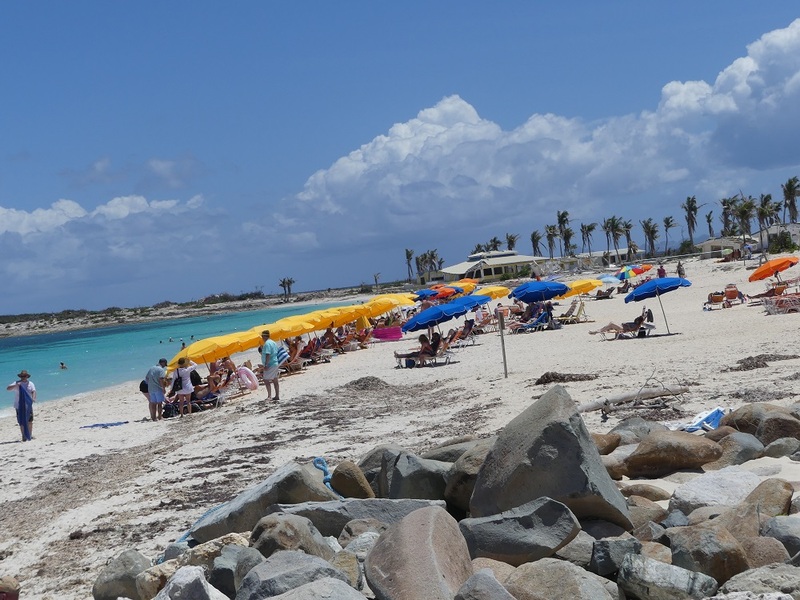 ORIENT BAY – The scars Hurricane Irma inflicted back in September of last year on Orient Beach, once the island’s prime tourist destination, are still visible but the place is slowly coming back to life. Tourists are returning and small businesses have sprung up here and there. Most importantly, the beach is in good shape. It is wide – and white. Most of the beach lovers are on the far end in front of the now defunct clothing optional resort Club Orient. The characteristic yellow parasols give the beach its sunny outlook. Way back from the beach a bar has been established. 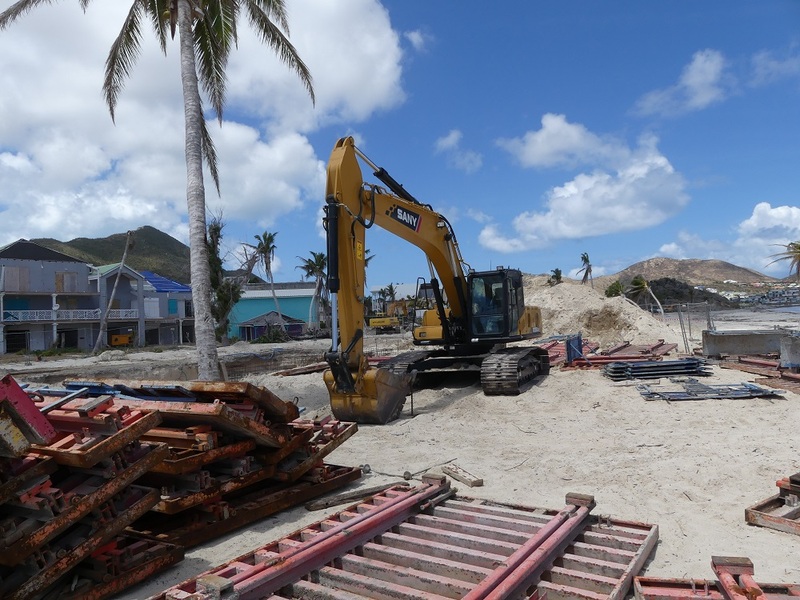 Near Orient village, heavy equipment operators are working on the reconstruction of Bikini Beach for Sindex Tours that obtained a building permit for the construction of close to 137 square meters (see photo above). Bikini Beach will be set further back from the high water line as well. Further down the beach, work is also underway to rebuild other beach bars and restaurants but the way it looked on Tuesday it could take some time before these jobs are finished. 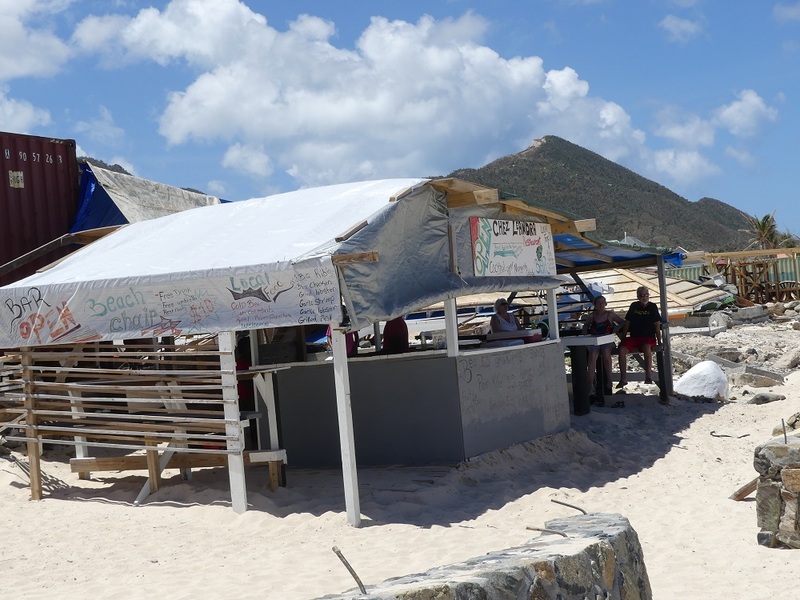 Months ago, when there was no activity whatsoever on the destroyed and deserted beach, a little green cabin sprung up right next to Pedro’s, a bar that is still completely in ruins. 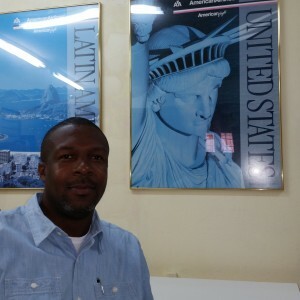 It was the initiative of Luis, a South American who sells pareos and swimwear. In front if his cabin a local man sits in the sand, displaying some handicraft, but he does not want to be photographed, unless I give him 5 dollars. Unfortunately, I went to the beach with empty pockets, so that picture did not come about. Just behind Luis’ pareo and swimwear cabin is the beach bar and restaurant Chez Leandra; further down a small company is renting out jet skis. 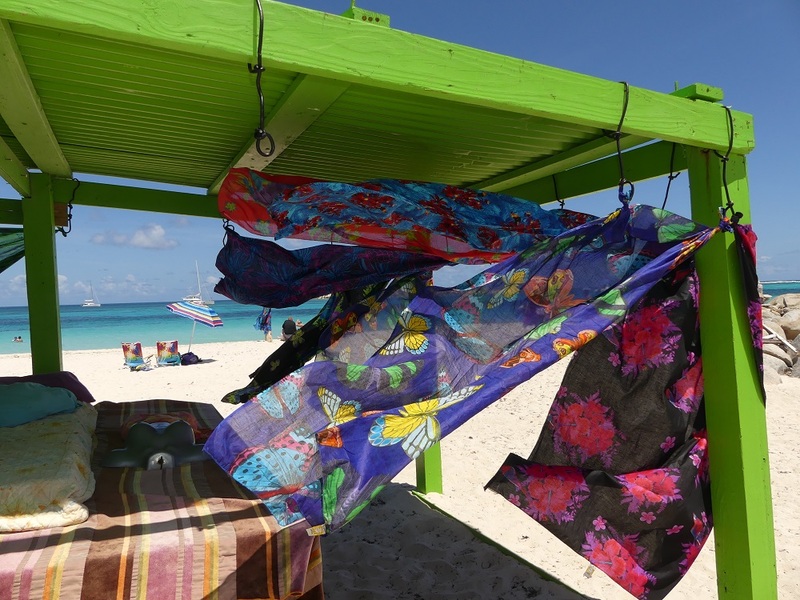 The return of several beach vendors – peddling hats, pareos and other odds and ends – indicates that Orient Beach is now again attractive for business as well. 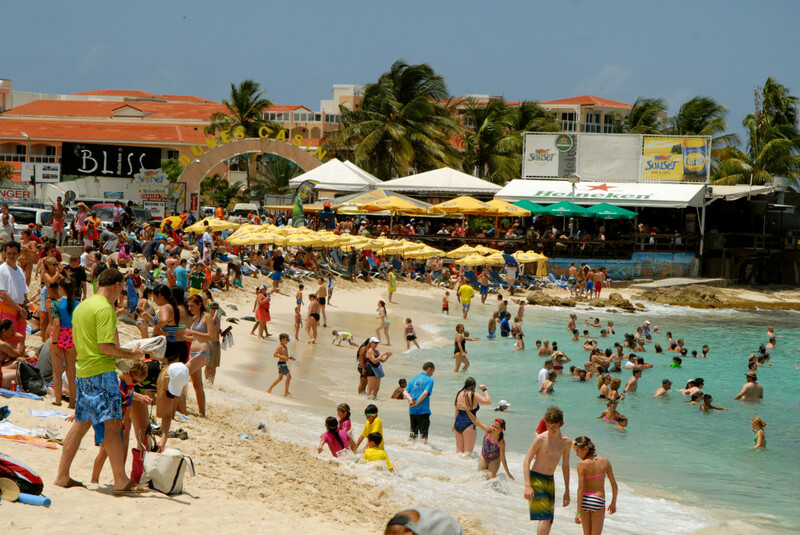 Two American tourists, camping out under an improvised tent, said that they are happy to be back in St. Maarten, though they had expected more people on the beach. Why not go to the Club Orient Beach? “Nah, they’re all naked there. We don’t want to go there,” was the reaction. Photo caption: Chez Leandra is back with an improvised beach bar. Photo Hilbert Haar. 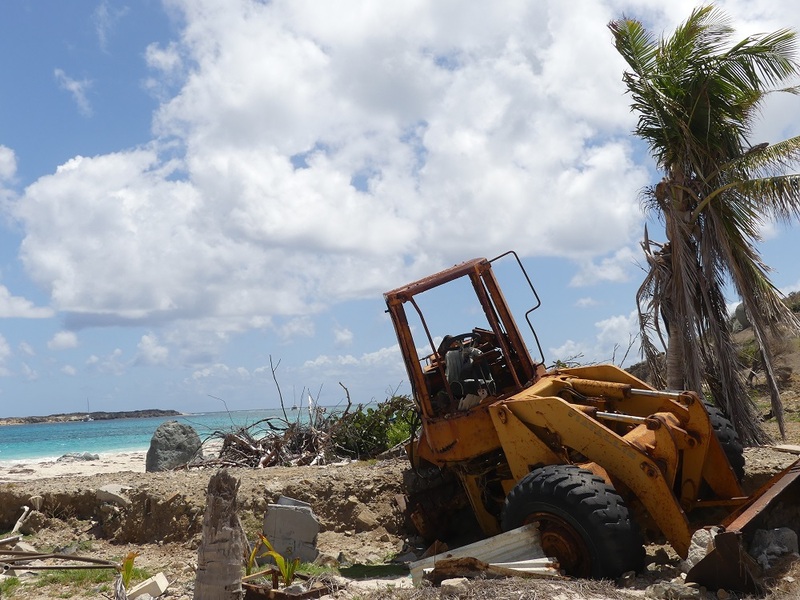 Photo caption: A destroyed excavator rests in the sand near The Palms. Photo Hilbert Haar. 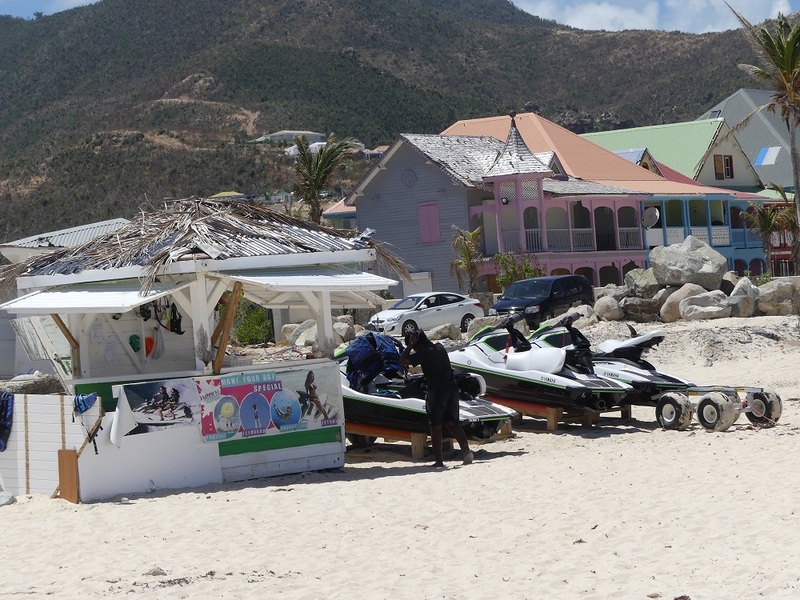 Photo caption: A small operation but still jet ski rentals are back on Orient Beach. Photo Hilbert Haar. 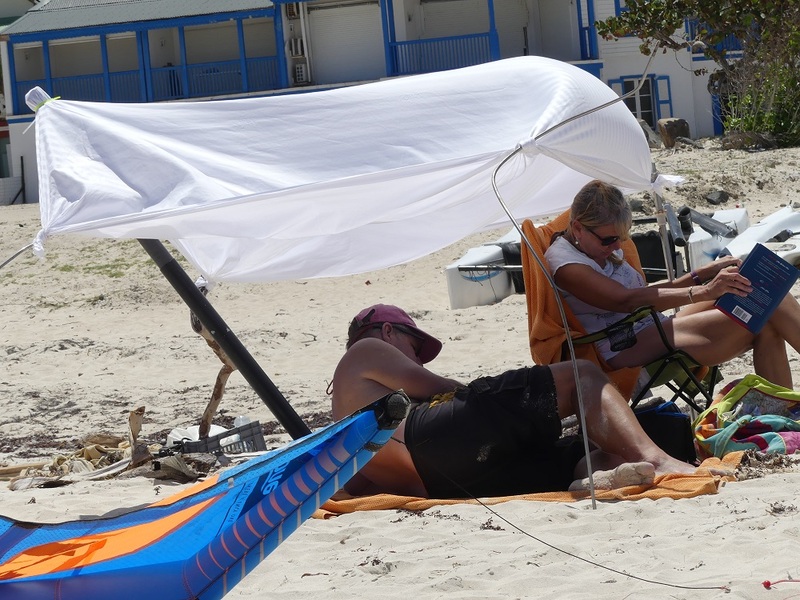 Photo caption: American tourists enjoy the beach under an improvised tent. Photo Hilbert Haar. Photo caption: A walk on the beach – it doesn’t get more peaceful than that. Photo Hilbert Haar. Photo caption: A beach vendor haggles with a potential customer. Photo Hilbert Haar. Photo caption: This little hut of pareo and swimwear vendor Luis was the first one to return to Orient Beach. Photo Hilbert Haar. 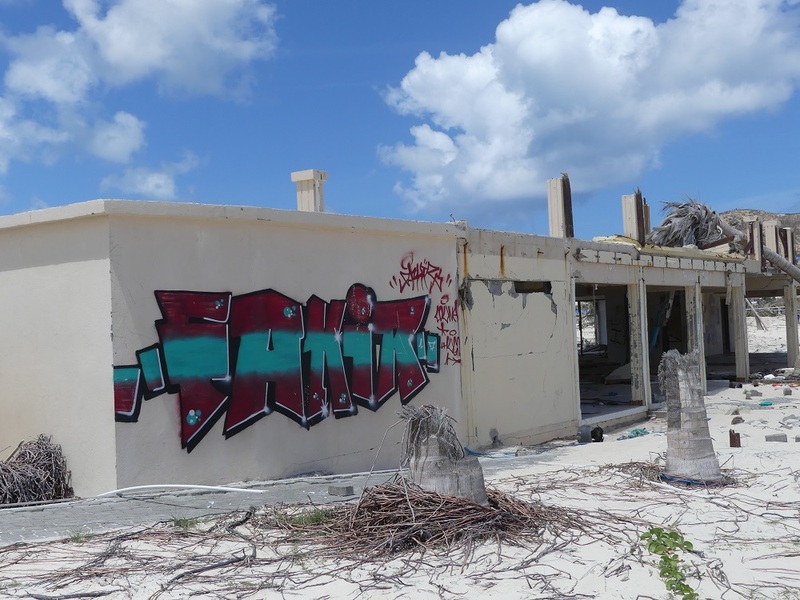 Photo caption: The Palms is still in ruins and has become a platform for graffiti artists. Photo Hilbert Haar. Top photo caption: The characteristic yellow parasols of Club Orient are back on the beach. Close-by photography on this beach is prohibited. Photo Hilbert Haar. MARIGOT – The waterfront boulevard in Marigot is not what it used to be anymore after Hurricane Irma hit the place. Now it appears that two of the main attractions on this stretch – the French bakeries Sarafina and Le Divin – will not be rebuilt. Le Divin has been completely obliterated by the monster hurricane and the debris is still exactly where it landed on September 6. Attempts to locate its owner, and to make arrangements for a cleanup, reportedly have failed so far. It seems likely that the owner has simply left the island. A bit further down on the Boulevard de France, French bakery Sarafina has also been wiped out… Click here to read the rest of the special report and to view the before and after pictures. 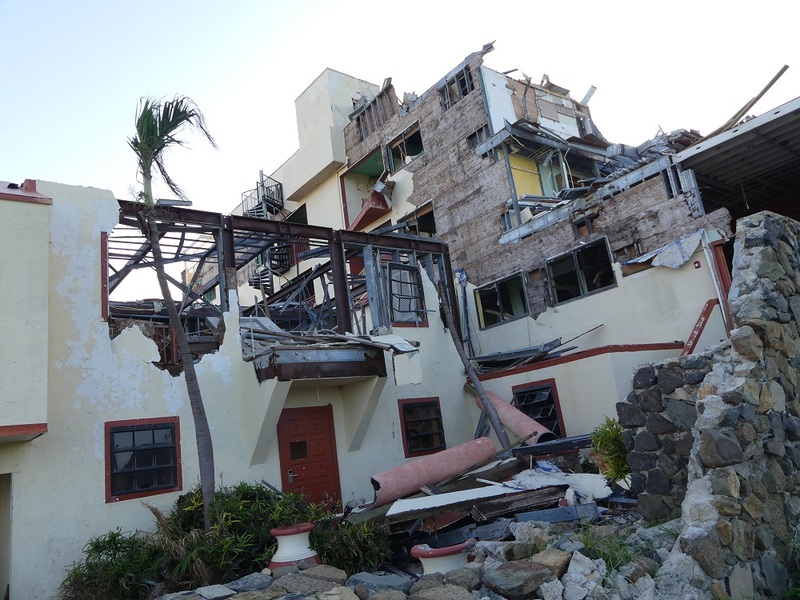 GREAT BAY – The Summit Resort in Cupecoy is the first fatal victim of Hurricane Irma. After 44 years in business, the resort has definitively closed its doors. A bit further down the road on Cupecoy, the Ocean Club – scene of the most gruesome double murder in recent history, when the seriously disturbed Meyshane Johnson killed Thelma and Michael King on September 19, 2012 – is in such a bad shape that management has announced its closure until further notice. Summit-owner Bruce Jakubovitz writes in a letter to his timeshare owners that there is “an enormous gap” between the estimated rebuilding costs and the limited insurance coverage and the limited revenue from timeshare and hotel operations. Each timeshare-owner will receive a pro rata part of the insurance payment. “This is likely to be a low number given the sublimit imposed by our insurance carrier for damages caused by hurricanes,” Jakubovitz wrote. The plan is to clean up the debris. When that is done, the site will be fenced off. All employees have lost their job. The Ocean Club has announced on its Facebook-page that the resort is closed until further notice and that members will be updated via email. 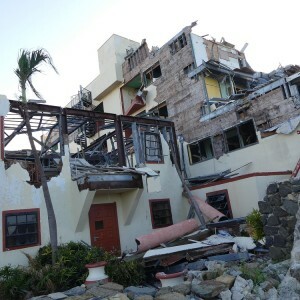 Photo caption: The Ocean Club in Cupecoy is severely damaged. Photo Hilbert Haar. GREAT BAY – The Court in First Instance dealt a severe blow to the Alegria Resort in Beacon Hill to the delight of Andrew Robert and Mary Corbett Stevenson and the Timeshare Owners at Caravanserai Association. The court ruled that Alegria has to respect the rights of the timeshare owners at its resort, under threat of a penalty of $10,000 per week if the company does not abide by the ruling. The court declared it enforceable without delay. When Alegria bought the Caravanserai Resort at auction in August 2014 it did not take long before timeshare owners received a letter from the new owner (on September 30, 2014) announcing that their timeshare rights had become null and void. In the past, the Stevenson’s bought four timeshare weeks at Caravanserai – an investment of $74,800. 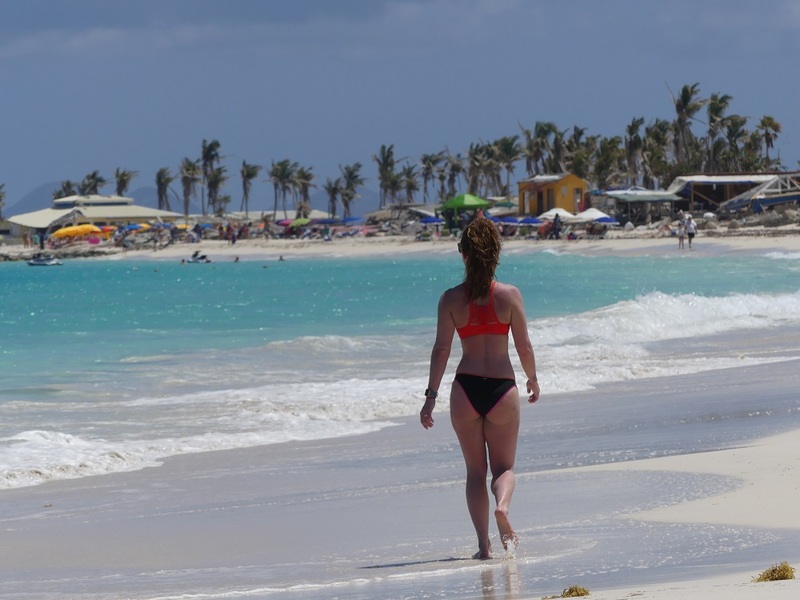 When Alegria voided the timeshare contracts with the argument they were not part of the auction, the Stevenson’s and other disgruntled timeshare owners joined forces in the Timeshare Owners at Caravanserai Association to fight for their rights in court. Alegria also has to pay damages the Stevensons incurred from being unable to use their timeshare apartments. The exact damages still have to be properly specified. 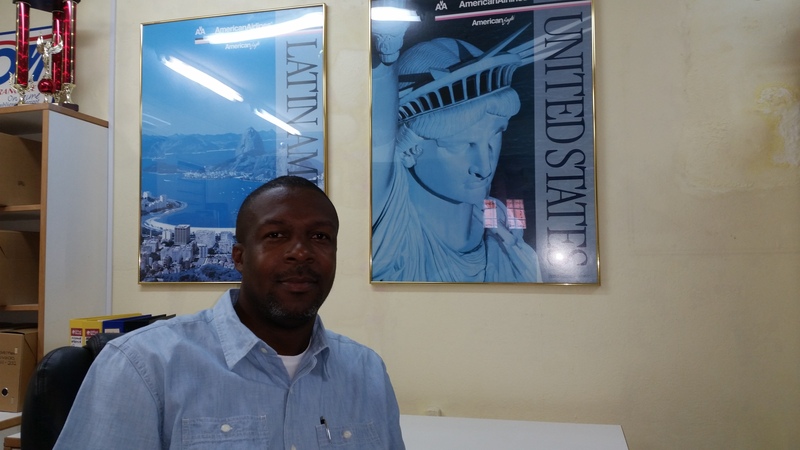 Alegria also has to pay all court fees; they amount to almost 6,800 guilders ($3,800). The court ruled that Kildare properties (the previous owner of the resort) was the seller of timeshare contracts and that these contracts came about through a company called Endless Vacation. Both companies were controlled by Haresh Manek. The court qualified the timeshare contract as lease agreements and noted that Kildare had permission from the bank to enter into these contracts. “Alegria is held to respect the rights of the timeshare owners the way Kildare did,” the court ruling states.